Vacationers may not be able to control the cost of gasoline this summer, but there are many travel costs that can easily be controlled - and even reduced - by following these tips offered by Xanterra Parks & Resorts (www.xanterra.com), the nation's leading operator of lodges, restaurants and other concessions in national and state parks and resorts. Take advantage of value-added packages. Many parks and resorts are bundling family amenities to make your stay more attractive. Look for bundled dining options, kid's activities and more. Search for Internet-only deals. Ohio State Park Resorts (www.atapark.com) offer "Hot Dates," deep- discount specials listed only on the website for travel within two weeks. Last-minute travelers will also find a number of Internet-only deals at the Gideon Putnam Resort (www.gideonputnam.com) in Saratoga Springs. Although the destination of Saratoga Springs is popular throughout the summer, these online specials permit even the stingiest bargain-hunter to find a deal. Stay in national parks, not in gateway communities. At national parks, rates for rooms, food and gift shop items are based upon a government-monitored pricing model that ensures rooms and meals are priced similar to comparable rooms and meals outside the park. Travelers pay the same amount of money for a room at the South Rim of Grand Canyon National Park (www.grandcanyonlodges.com) and a room in a franchise motel in the gateway community of Tusayan. Also, room rates inside the parks do not increase as availability decreases, a practice called "yield management" that is common in the hospitality industry. Purchase souvenirs with care. Although it is always fun to splurge on a kitschy souvenir, many gift shops also offer high-quality, hard-to-find local artwork, jewelry and crafts. For example, the Hopi House on the South Rim of Grand Canyon National Park features a vast array of fine Native American jewelry. Since the jewelry - like all other in-park items - is subject to pricing according to the National Park Service's model of comparability, it is guaranteed to be fairly priced. "True bargain-hunters will do their research and then visit Xanterra gift shops multiple times before purchasing a high-quality piece of jewelry," says Judi Lages, vice president of sales & marketing for Xanterra Parks & Resorts. "Half of the fun of shopping is the hunt, and our gift shop staff is knowledgeable about the pieces we sell." Take a hike. It's free, and one of the best ways to truly see a beautiful destination is on foot. Take advantage of breakfast and lunch buffets. "Buffets have changed a lot over the years, and travelers have a right to expect more than just rubbery scrambled eggs for breakfast," said Lages. "Our creative food and beverage teams have made sure that our reasonably priced buffets feature high- quality food that will satisfy every traveler." Take advantage of free naturalist programs. 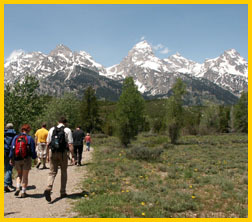 In national parks, rangers offer a variety of hiking, campfire and other naturalist programs. A good source for National Park Service information is www.nps.gov. Many state parks offer similar programs, as well. Inside a national park, let someone else do the driving. Xanterra offers interpretive motorcoach tours in the Grand Canyon and Yellowstone (www.travelyellowstone.com). These tours include stops at park viewpoints and an ongoing interpretive talk by drivers who are knowledgeable about the human history, geology and wildlife in each park. "There's no reason to spend more time - and gas - in your own car when trained drivers can take travelers to the same destinations," said Lages. Travel during shoulder seasons. In many locations, the two weeks after Memorial Day and two weeks before Labor Day have plenty of room availability - and fewer visitors. So travelers may be better able to find the perfect lodge room. Some locations offer spring and fall room rate discounts.